Recently, DVDVideoSoft forum is witnessing a continuing demand for a Mac version of free studio. Despite there has been some rumors about developing a free studio for Mac edition in next year, it seems that nothing has been done by its developer DVDVideoSoft. As for people who want to download free studio on Mac platforms like MacBook Pro, MacBook Air, iMac, etc, they will turn to a great similar program instead. And this guide is for those who are looking for an alternative that is packed with more features like download, record, edit and convert video on Mac that Free Studio may not have. Free Studio is an all-in-one video toolkit bundling multiple converters into one handy program, with YouTube downloading and video converting features most renowned among users. It gets rid of spyware or adware, enabling you to freely download YouTube videos and convert videos to MP4, AVI, WMV, FLV, Apple iPhone, iPad, Android, etc with a few simple clicks. But as its official website claims, Free Studio is only available for Windows/Vista/XP. In other words, you may be in a great dilemma in case of putting videos on Mac with Free Studio. So finding an alternative that works on Mac OS X is indispensible. No matter what your multimedia demands are, MacX Video Converter Pro demonstrates itself to be a solid alternative to DVDVideoSoft Free Studio for Mac version. It is an all-in-one video converter, YouTube downloader, screen recorder, slideshow maker and video editor, which satisfies all your multimedia needs and assists you to enjoy videos on macOS Mojave without any hassle. Whether you are going to convert MPEG, MOV, AVI, MP4, WMV, AVI, FLV or transfer 1080p MKV, MTS, AVCHD videos, the free studio software for Mac makes it happen a few seconds with high quality. Below is the detailed operations of the free studio for Mac to download and convert video on Mac computer. After you get the alternative to Free Studio downloaded on Mac, install and run it, the following will dwell on the YouTube downloading and converting steps. Hit the "YouTube" button at the top. Find the video you'd like to download. As soon as you click "paste & analyze" button, the DVDVideoSoft Free Studio Mac alternative software will automatically detect the YouTube video opened in browse. Or you can simply copy the target YouTube video address, paste it to the address bar and click "analyze" to load the YouTube video details in the software. Hit "Download Now" to start the YouTube download. Tips: This video converter for Mac also supports 4k ultra HD video download without compromise speed and quality. This program supports converting both SD and HD videos, like MKV to MP4, MKV to AVI, AVCHD to MOV, MTS to MP4, etc, even directly enables you to import video files from camcorder devices with simple steps. You just need to drag and drop the files you want to convert into this Free Studio for Mac, select an output format (audio or video) or device that you want to play on from the pop-up window. Then, just click the "RUN" button to convert your files. As a matter of fact, people seeking for a replacement of free studio are not merely out of Mac incompatibility but also due to other issues with Free Studio as below many users complain. 1. Most programs in Free Studio are simplistic but are not bundled into one interface under the hood. 2. Free Studio has a few issues with iPhone video converter. 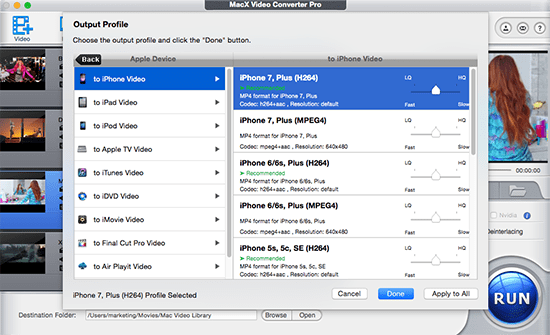 To be specific, the videos converted to iPhone output format with this program cannot be recognized by iPhone series. Based upon the abovementioned errors in Free Studio, finding an alternative is a must have. And MacX Video Converter Pro meets all your needs, not only being the best Free Studio for Mac alternative, but also handling all the issues that Free Studio encounter.